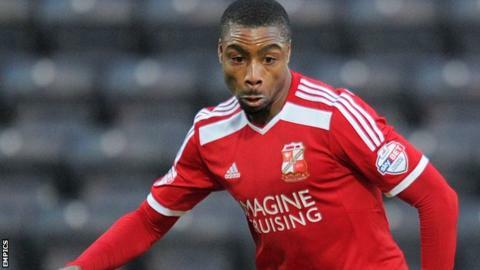 Swindon ended a run of three defeats thanks to Jonathan Obika's injury-time equaliser against Doncaster Rovers. Nicky Ajose lobbed Swindon ahead, before Keshi Anderson slotted home a low shot to equalise. Drissa Traore's foul on James Coppinger handed Doncaster a penalty, which Andy Williams calmly slotted into the bottom corner with 10 minutes left. But Swindon fought back, with Obika heading in a Yaser Kasim corner to secure the draw. Match ends, Doncaster Rovers 2, Swindon Town 2. Second Half ends, Doncaster Rovers 2, Swindon Town 2. Richard Chaplow (Doncaster Rovers) is shown the yellow card for a bad foul. Foul by Richard Chaplow (Doncaster Rovers). Attempt missed. Andy Williams (Doncaster Rovers) left footed shot from the left side of the box is too high. Andy Butler (Doncaster Rovers) wins a free kick on the left wing. Foul by Nicky Ajose (Swindon Town). Goal! Doncaster Rovers 2, Swindon Town 2. Jonathan Obika (Swindon Town) header from very close range to the centre of the goal. Assisted by Yaser Kasim following a corner. Corner, Swindon Town. Conceded by Andy Butler. Richard Chaplow (Doncaster Rovers) wins a free kick in the attacking half. Corner, Doncaster Rovers. Conceded by Yaser Kasim. Substitution, Doncaster Rovers. Harry Forrester replaces Keshi Anderson. Substitution, Swindon Town. Jermaine Hylton replaces Drissa Traoré. Drissa Traoré (Swindon Town) wins a free kick in the attacking half. Goal! Doncaster Rovers 2, Swindon Town 1. Andy Williams (Doncaster Rovers) converts the penalty with a right footed shot to the bottom left corner. Penalty Doncaster Rovers. James Coppinger draws a foul in the penalty area. Penalty conceded by Drissa Traoré (Swindon Town) after a foul in the penalty area. Corner, Doncaster Rovers. Conceded by Jordan Turnbull. Corner, Doncaster Rovers. Conceded by Jordan Williams. Attempt missed. Aaron Taylor-Sinclair (Doncaster Rovers) header from the centre of the box is close, but misses to the left. Keshi Anderson (Doncaster Rovers) wins a free kick in the defensive half. Attempt saved. Dany N'Guessan (Doncaster Rovers) right footed shot from the centre of the box is saved in the top right corner. Goal! Doncaster Rovers 1, Swindon Town 1. Keshi Anderson (Doncaster Rovers) right footed shot from the left side of the box to the bottom left corner. Substitution, Swindon Town. Jonathan Obika replaces Fabien Robert. Attempt missed. Richard Chaplow (Doncaster Rovers) right footed shot from the centre of the box misses to the right. Attempt missed. Louis Thompson (Swindon Town) left footed shot from outside the box is close, but misses to the left. Henrik Ojamaa (Swindon Town) wins a free kick in the attacking half. Attempt saved. Dany N'Guessan (Doncaster Rovers) right footed shot from the centre of the box is saved in the top centre of the goal. James Horsfield (Doncaster Rovers) wins a free kick in the defensive half.